I always think toaster strudel looks so amazing when I see it in the freezer section of the grocery store. A hot and flaky danish filled with fruit, yes please! BUT like many things, it's too good to be true. And every time I buy it and bring it home, I'm so disappointed! It never tastes as good as it looks. So I finally decided to make it at home. This strudel is not cooked in a toaster, so it's not as easy to make as popping the frozen strudel into a toaster. It is cooked in the regular oven, but it's so worth it because it tastes flaky and delicious and is full of yummy raspberry filling! These raspberry pastries are so delicious and easy to make! 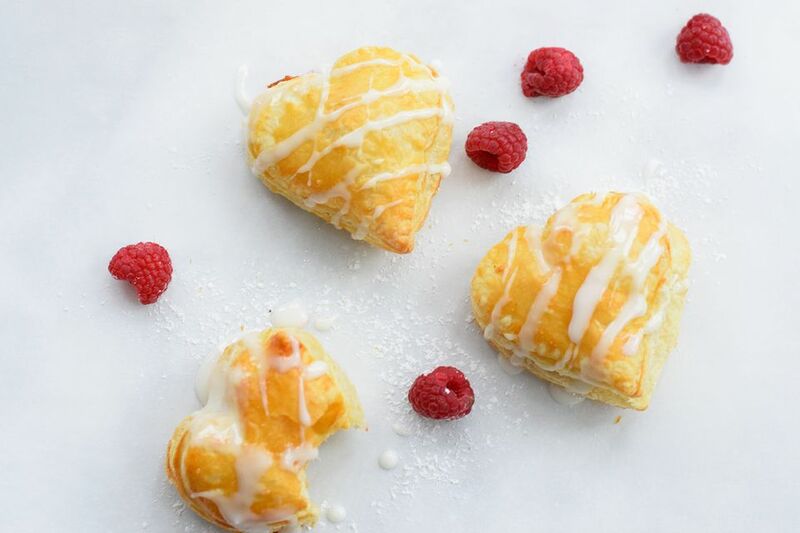 They are perfect for Valentine's Day Breakfast when you cut the pastry into adorable little hearts! Thaw the frozen puff pastry sheet on your countertop. It should take around 30 minutes to thaw, but it may take up to an hour. Keep an eye on it and cover it in a very slightly damp towel if it feels like it is drying out. After the dough has thawed, preheat the oven to 400 F.
Unfold and place the puff pastry on a sheet of parchment paper. Roll the dough into a larger rectangle. Use a medium sized heart shaped cookie cutter to cut out about 10-12 hearts, depending on the size of your cookie cutter and how thin you have rolled the dough. Remove the excess dough, leaving just the hearts on the parchment paper. Prick all of the hearts about 3 times with a fork. Place them on a fresh piece of parchment paper on a baking sheet. Make sure they are spread about 1 inch apart, as they will puff up. Place about 2-3 teaspoons of the raspberry jam into the center of half of the hearts. Leave about a 1/8 inch section around the edges of the jam. Beat the egg until completely beaten. Brush the edges of the hearts with the jam with the egg wash.
Place the remaining hearts on top of the ones with jam. Use a fork to crimp the edges of the hearts together. Using a pastry brush, brush the top of each strudel with the egg wash. Bake on a center rack for about 15 minutes, depending on your oven. The tops should be a light golden brown. Remove them from the oven and allow them to cool. While they are cooling prepare the glaze. Whisk together the milk and powdered sugar. If it looks too thin, add a little more powdered sugar. Drizzle the glaze over the top of each strudel and enjoy!